In March 2018, the US Food and Drug Administration approved the antipsychotic drug lurasidone (Latuda) for the treatment of bipolar depression in children and adolescents aged 10–17 years. Lurasidone was already approved for adults with bipolar depression, as an add-on treatment to the mood stabilizers lithium and valproate, and for schizophrenia in people aged 13 years and up. A 6-week clinical trial in 347 youth compared lurasidone (in doses ranging from 20 to 80 mg/day) to placebo and found that those who received lurasidone showed significant improvements in depression compared to those who received placebo. The average dose was below 40 mg/day. The research by Melissa P. DelBello and colleagues was published in the Journal of the American Academy of Child and Adolescent Psychiatry in 2017. In the study, lurasidone was well-tolerated. Side effects included nausea, sleepiness, minimal weight gain, and insomnia. Lurasidone did not seem to affect glucose, triglycerides, cholesterol, or blood pressure. 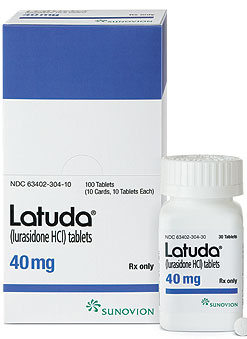 Editor’s Note: This is the first drug to be approved for bipolar depression in this age range. This editor (Robert M. Post) has written extensively on the high incidence of childhood onset bipolar disorder in the US, and especially in the offspring of parents with bipolar disorder. It is important to be alert to the possibilities of depression and bipolar disorder in children in the US (along with related illnesses such as anxiety, oppositional defiant disorder, and attention deficit hyperactivity disorder (ADHD)), as early-onset illness tends to have a more severe long-term course than adult-onset depression and bipolar disorder. A longer delay between the emergence of symptoms and the first treatment for bipolar disorder is also a risk factor for more severe depression, more time depressed, and a poorer outcome in adulthood. Parents of children aged 2-12 who have mood or behavioral problems are encouraged to consider joining the Child Network at our website, bipolarnews.org (click on the tab for the Child Network). By participating in this research network, parents are able to make a weekly rating of the severity of their children’s symptoms of anxiety, depression, ADHD, oppositional behavior, and mania via the secure website. The ratings can then be shared with the child’s clinicians for easy visualization of the course of symptoms over time, which may help with treatment decisions.